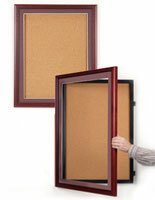 This Ovation locking bulletin board is a secure means for posting information indoors. The black aluminum framing and gray fabric interior provide a neutral background suitable for any commercial or school building. 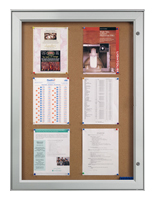 The locking bulletin board, also known as a tackboard, features two independent panels that lock. The lenses are made with shatter resistant acrylic. 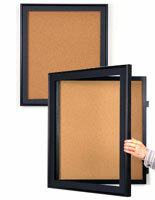 This locking bulletin board that has acrylic panels is a safe alternative to similar units with glass lenses. The framing features radius corners for a polished look. 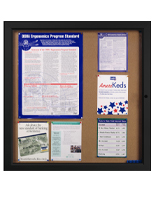 Each locking bulletin board that is wall mounted has sufficient display area to post several different announcements. 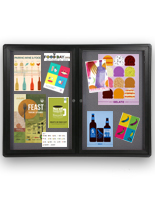 The black framing is powder coated aluminum with rounded corners. 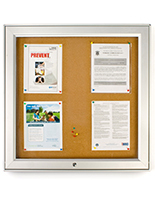 Each locking bulletin board features a fabric surface that is color fast and will remain free from damage even after years of repeated postings. There are pre-drilled corner mounting holes located on the rear of the changeable letterboard to allow for easy mounting. This locking bulletin board does not include any hanging hardware. Appropriate screws and anchors can be purchased at a local hardware store. 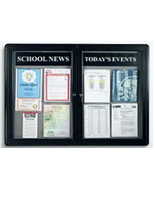 Mount this locking bulletin board with hinged doors in a school hallway or office entryway to post important notices or building information. Changing announcements is easy to do by unlocking each panel with the included keys. 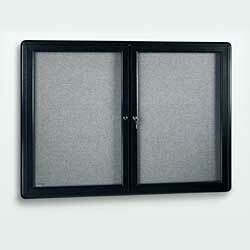 This locking bulletin board will keep important message and documents secure and free of dust and dirt. 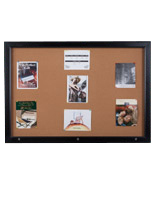 Buy this tackboard for indoor use for your office, school or business today!